I've been photographing quilts for my wife and her quilt guild (and a few others) since about 1996 . By now I've photographed more than 300 quilts. I thought others might be interested in how I do them. I do digital editing on all the quilts I photograph, but most of the shooting techniques here also apply if you don't edit. Hopefully this article will help you avoid this Gallery of Wrongs. At first I was using a Canon 35 mm Single Lens Reflex. I shot Kodak print film, had it developed at a nearby 1-hour photo, and scanned the prints on my Epson flatbed scanner. This is a bad method -- I only did this because I had to at the time. I struggled with this method for 3-4 years, tearing my hair out the whole time -- it is almost impossible to get the color right this way -- especially with 1-hour photo labs. And, time restraints often don't allow for sending off to a good lab. This can take a long time if you mess up the first try and have to wait for the mail twice. When time permits I use an online (commercial -- not professional) lab called Snapfish. I don't get anything for plugging them and Shutterfly's printing is as good, they just aren't quit as friendly as Snapfish. If you have a good quality professional photo lab within driving distance you may be able to make film work. If you try film, use slide film instead of print film and have the lab use their film scanner to scan selected slides for you. Usually you won't get excellent results scanning slides on your flatbed scanner even if it's advertised to do it -- they need to be scanned on a decent quality film scanner. Deciding on the minimum resolution is a little complicated. Just be sure the scan is at least 2500 pixels on the longest side. Normally 1-hour labs can't produce this resolution. I use indirect outdoor light (sunlight). Avoid direct sunlight -- it will bleach/wash out the colors. This means often you'll be using skylight -- on a clear sunny day, if you are in a shaded area the indirect light is coming from the blue areas of the sky, thus it's called "skylight." A problem with skylight is it can give a blue cast, but you have to use something. If you shoot outside, the slightest wind is likely to be a problem. A quilt is like a sail -- it picks up the slightest breeze. I found I could hang most quilts on my double garage door using the pseudo-sleeve (described below) with twine on the ends draped over the top of the door and the twine adjusted and affixed to the inside of the door. 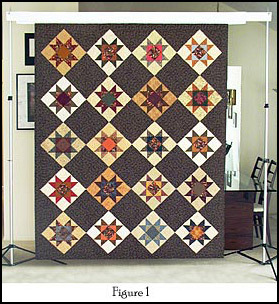 However some quilts are too large for this. Another way is to hang it against a wall of the house if you have an area that's out of the sun part of the time between 9am to 3pm, is large enough and doesn't have irregularities like windows, etc . Either way some days it's raining or too windy or too cold for outdoor shooting. I didn't plan it, but as it turns out my living room has tall floor-up windows along one wall. It also has a cathedral ceiling that lets me hang large quilts. So, I now take all quilt pictures in my living room. I try to do it on a clear day so bright indirect/reflected sunlight comes through the windows. In a pinch I shoot on cloudy days and the results are good, but I find the better light improves the colors some and reduces the 'noise' digital cameras tend to add with low-light exposures. If you want to bring out the texture/relief of the quilting you need some side light. But, sidelight will fall off (get dimmer) across the quilt. Also, sidelight brings out irregularities in the quilt. I've found quilters prefer flat lighted photos, so I normally don't use side lighting anymore except for close-up/detail shots. If you use indirect sunlight, as I do, be careful it isn't being reflected from a colored surface/area. I'm lucky that all three surfaces light bounces off of to come into my living room are neutral -- a light gray brick wall, a darker gray deck, and a white carpet. 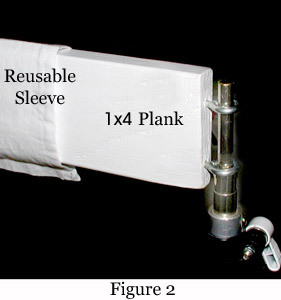 Figure 1 shows how I hang the quilt. The uprights are from a quilt stand, but the hanging bar at the top is homemade. The stand came with a telescoping hanging bar, but the bar sags under the weight of the quilt. I usually hang the quilt sideways, but this one was longer than my hanging bar. I didn't do it here, but it's good to put a solid white (or black) background (sheet/felt/foamcore?) behind the quilt to hide the clutter and set the quilt off. Also, it will help you separate the quilt from the background in your image editor, assuming you do that. If you intend to extract the quilt from the background white is normally best, but if the binding is light a black background works better. NOTE: This is an ooold RPS stand. Do not buy Savage stands. They're cheaply made and break constantly. RPS stands cost a little more, but they stand up (groan...). This one has been used and abused for years and still does the job. 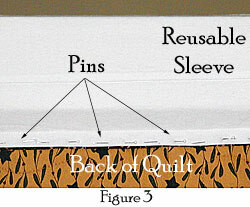 Before it's put on the hanging bar the sleeve is pinned to the top of the quilt as shown in Figure 3. People seem to think this take a lot of time. It takes about 10-15 minutes. After it's hung and raised off the floor I use a steel tape measure to adjust each end of the hanging bar to the same height, so the bar is level (quilt hangs right). You probably can't get the camera this level, so if you edit the image you'll still need to straighten it. Here's a different hanging solution I've been thinking about. If you have a large enough design wall, good lighting and enough distance in front of it to get the camera far enough away, that's probably a better way to hang the quilt. Assuming your camera has a zoom lens, position the camera far enough away that you can zoom it a little. Lenses at their widest wide-angle create a lot of distortion called "barreling", where the sides of the quilt will bow out like a pillow-- like this. Now for the hard part -- getting the camera centered left to right. Position the camera about where you think is centered. Using the viewfinder, point the center of the frame at the center of the quilt. [Tip: If you have a zoom feature, zooming in temporarily helps with this center aiming.] Then, take a piece of twine long enough to reach from the camera to the edge of the quilt. Attach (or hold it) to the lens (to the top or bottom front edge, don't touch the glass). Then take the other end of the twine and, keeping it level, hold it at the left or right edge of the quilt and pinch the string, then move it to the same height on other edge-- see Figures 5 (left edge) & 6 (right edge). Move the camera/tripod left or right and point the lens at the middle. Repeat this until the twine touches the right and left edges of the quilt at the same point/length of twine (within 1/4" is good enough). Recheck that the viewfinder is still on the center of the quilt and repeat the string trick until the string lengths are the same with the camera pointed at the center of the quilt. 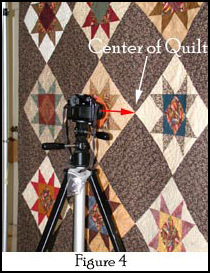 This procedure assures the camera is at the center of the quilt and at right angles (90 degrees) to the surface (plane) of quilt -- see figure 7. If the camera isn't square-on at the quilt you will get perspective error/perspective distortion -- the quilt won't be square. It will taper like this. This taper, called keystoning, can be corrected in an image editor but it's better not to have to. If you zoomed in to help with the setup, zoom back out and fill the viewfinder with the quilt (Include the white sleeve if you're using a digital camera on automatic (Auto) white balance. You can crop it out later). Finally, tilt/roll the camera left or right until the top edge of the hanging bar/quilt is parallel to the frame in the viewfinder. I used to use a small level to level the camera, now I just do it by eye -- the level never got it completely level. Even with a tripod you can shake the camera when punching the button, so if your camera has a connection for a cable release use it. Unfortunately most digital cameras don't provide for a cable release (why? ), so use the self-timer or remote control. Bracket your shot. That is, take at least two extra pictures, one with more exposure and one with less. If it will be hard to setup again go up and down two or even three steps (5-7 shots). With digital cameras there is no cost per shot. Most let you adjust exposure in 1/3 stop (exposure value) increments from underexposed 2 stops to over exposed 2 stops, so why not start at one end of this range and go to the other (13 shots/steps)? If the quilt is unusually dark or light the camera's exposure calculator will be fooled. It will make a dark quilt too light and a light quilt too dark. Leaving the camera on the tripod, I remove the memory card, and use a card reader to put the pictures into the computer and check to see if the shots are OK before tearing down the setup. I use image editing software to edit/prepare all quilt pictures. This is as important as shooting the quilt (maybe more important), but that's way beyond the scope of this article. If you want to learn how I prepare the images you can take my free lessons. If you want to see how this particular quilt turned out click here. 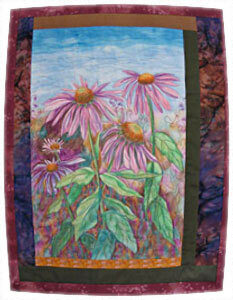 If you'd like to see some of my photographs of my wife's quilts click here. If something's not clear let me know.